Welcome to the heart of the Design Process! We at Nine Dot Connects have made a business of being a PCB design centric organization. That entails an understanding of all aspects of the design process, from specification and libraries, to manufacturing documents and Design for Manufacturing. We are passionate about a “holistic” approach to the design process. We are convinced to be successful in PCB design, one must know how all aspects of design come together. Much of our site and services are dedicated to that perspective. However, we would be foolish if we did not recognize that EDA tools are at the heart of the entire PCB process. When Altium Inc. ended its Value Added Reseller (VAR) channel in 2015, Nine Dot Connects took the opportunity to look beyond EDA tools and expanded our horizons to become best-in-class experts in all things PCB. Through our service and training programs, we were not only able to hone our skill set, they allowed us to maintain and increase our expert knowledge in Altium Designer. When Dassault Systems recognized our advanced PCB abilities and our knowledge of Altium Designer, they approached us to help with their EDA product, SOLIDWWORKS PCB. In turn, we recognized a tremendous opportunity to partner with a highly respected company becoming a powerful force in the EDA industry. 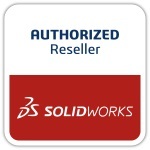 We at Nine Dot Connects are privileged to be selected by Dassault Systems to represent SOLIDWORKS PCB throughout North America.